by Peterson, George E., Annez, Patricia Clarke, Peterson, George E., Jr.
Peterson, George E., Annez, Patricia Clarke, Peterson, George E., Jr.
Presenting experiences from India, China, Brazil, South Africa and Poland, 'Financing Cities' examines the need to boost infrastructure investment in cities as well as the need for prudent fiscal management across all levels of government. 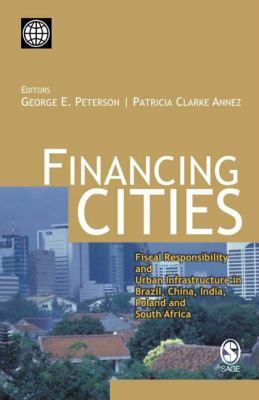 This is discussed within the context of the decentralization of service delivery responsibilities.Peterson, George E. is the author of 'Financing Cities Fiscal Responsibility and Urban Infrastructure in Brazil, China, India, Poland and South Africa', published 2007 under ISBN 9780761935643 and ISBN 0761935649. Loading marketplace prices 5 copies from $26.27 How does the rental process work?